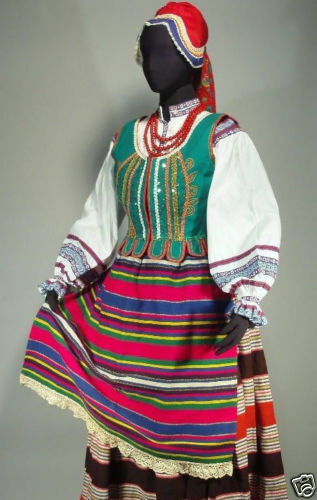 Hello all, today I am going to talk about the costume from the region where the Polish, Ukrainian and Belarusian borders come together. I have found references to this costume from books covering each of these three nationalities. This region was part of the Volyn' Principality in the days of Kievan Rus', was later incorporated into the Lithuanian empire, and then became part of the Polish Empire. When the Polish Empire was partitioned, this area went to the Austrian Empire, then became part of the multi-ethnic state of Poland after WWI. After WWII, the border was drawn along the northern Buh [Bug] river. Much of this region is now within the present Polish boundaries. This is enough to show the multi ethnic influences on this region. My sources agree that Polish started settling in this region from Mazovia in the 14th cent. 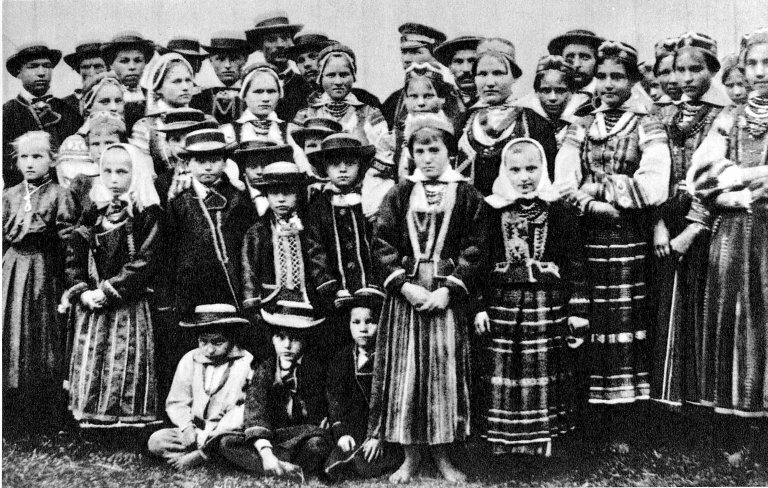 Ukrainians on the Polish side of the border were resettled either across the border or in western Poland at the end of WWII. There were distinctive local dialects in this region that are quickly dying out under the influence of the Literary Languages of the three states respectively. 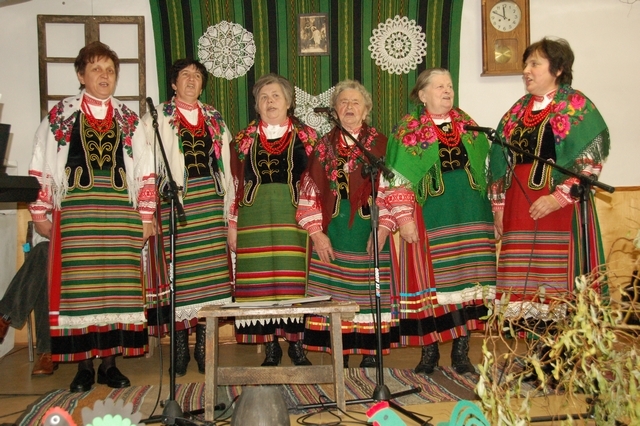 The image above is of a contemporary Polish dance group. 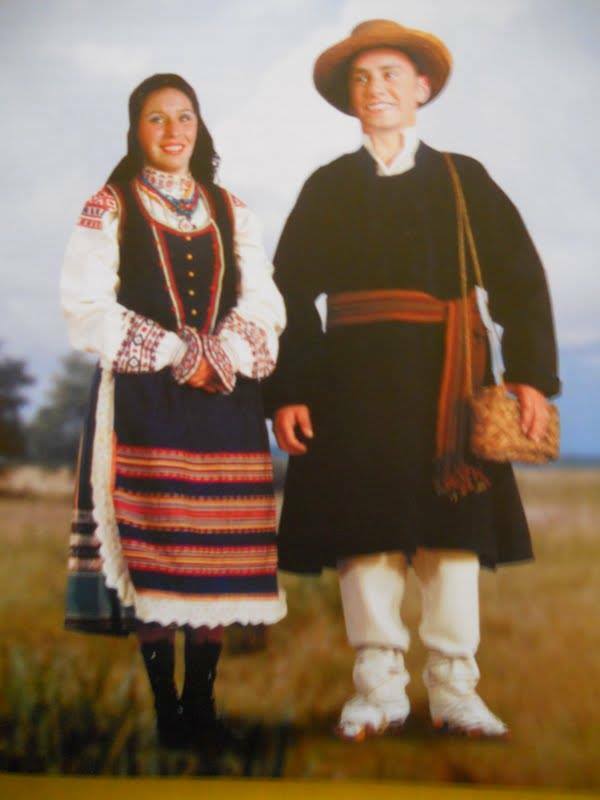 Here is the Damachow costume as presented by Mikhas' Ramaniuk in his book 'Belaruskaie Narodnaie Adzennie'. This was taken in 1910 in the village of Chersk, the region along the east bank of the Buh [Bug] river [in Ukrainian and Belarusian pronounced Boo-h, the h must be pronounced, in Polish pronounced Boog, with a long oo] near the town of Damachow, south of the city of Brest. 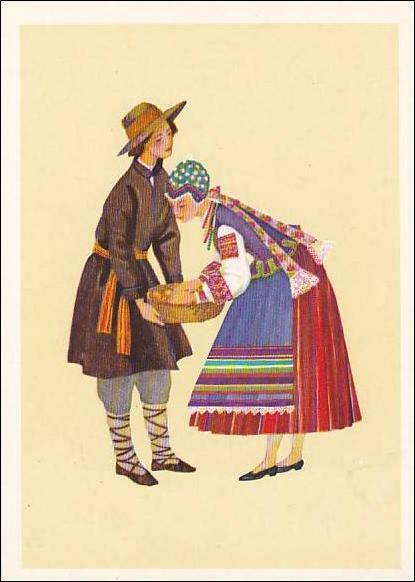 Kul'chytska, in her book on western Ukrainian costumes gives us these sketches made in 1937 in the village of Zabuzhia, along the eastern banks of the Buh [Bug] in the northwest corner of Ukraine. Here is a print from the Polish book 'Stroj Podlaski (Nadbuzanski)' by Janusz Swiezy, published in 1958. 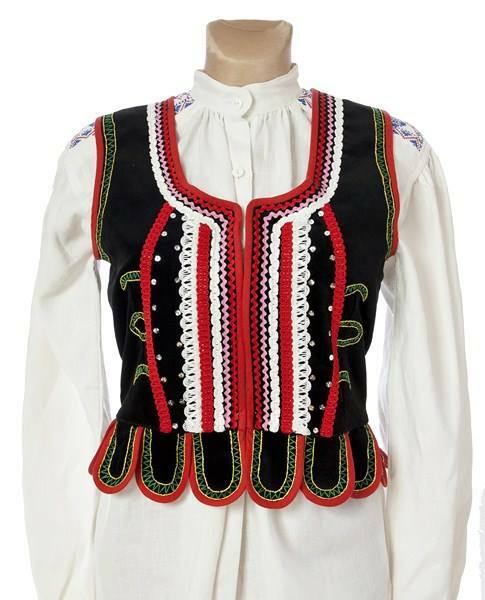 This costume was worn on the banks of the Bug [Buh] river, from the point where the Bug ceases to be the border, and flows west into the Wisla [Vistula] south almost to the town of Wlodawa [Volodova]. It was found further south on the eastern side. Here is a rough map of the area. 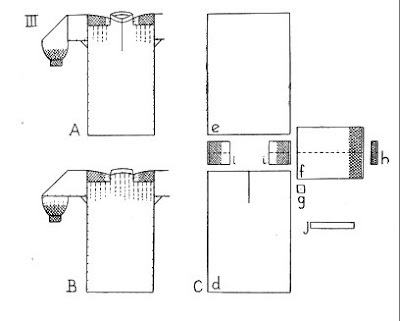 The eastern portion is the approximate range of the Zabuzhia costume. The northernmost of the three western portions is the range of the Biala Podlaska Mazovian costume, the central one is the range of the Radzynsk costume, and the southern is the range of the Wlodawa [Volodava] costume. The men's costume has little that is distinctive about it. 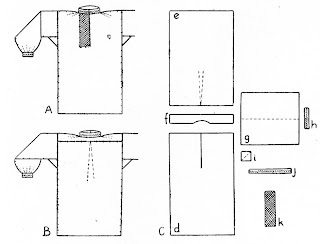 Linen shirt with woven or embroidered ornament, linen pants and footcloths, lychaky woven of birch or linden bark, woven sash, overcoat of natural wool, and straw hat. He could be from anywhere in a very wide region in these three countries. This first photograph is one of the very few that shows a man or boy with his overcoat open.The every shirt had little to no ornamentation and was closed at the neck with a red ribbon. 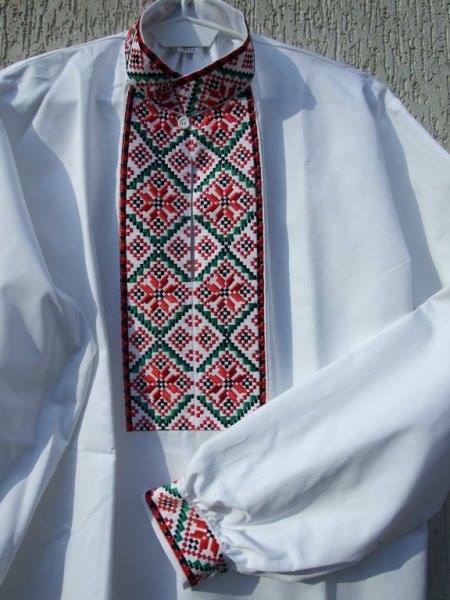 The man's shirt was originally sewn in the ustawka cut, as in west Ukraine or southeast Poland, which later was replaced by a cut with a yoke across the back of the shoulders. 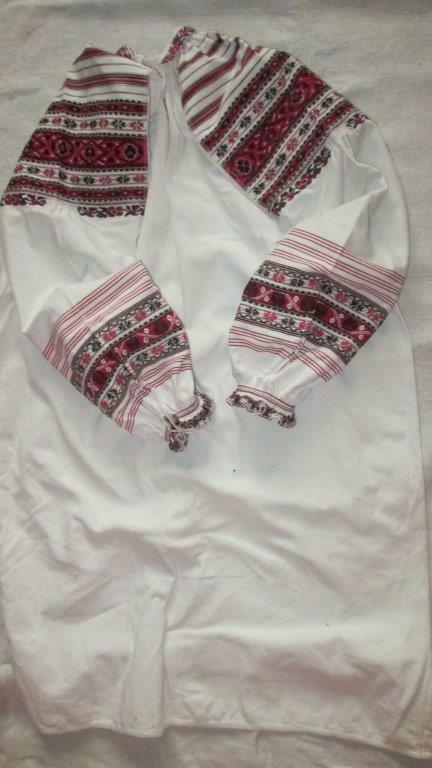 On a festive shirt, the cuff, standing or foldover collar, and a placket on the front of the shirt had ornamentation either woven in or cross-stitched, in designs typical of Polissia. 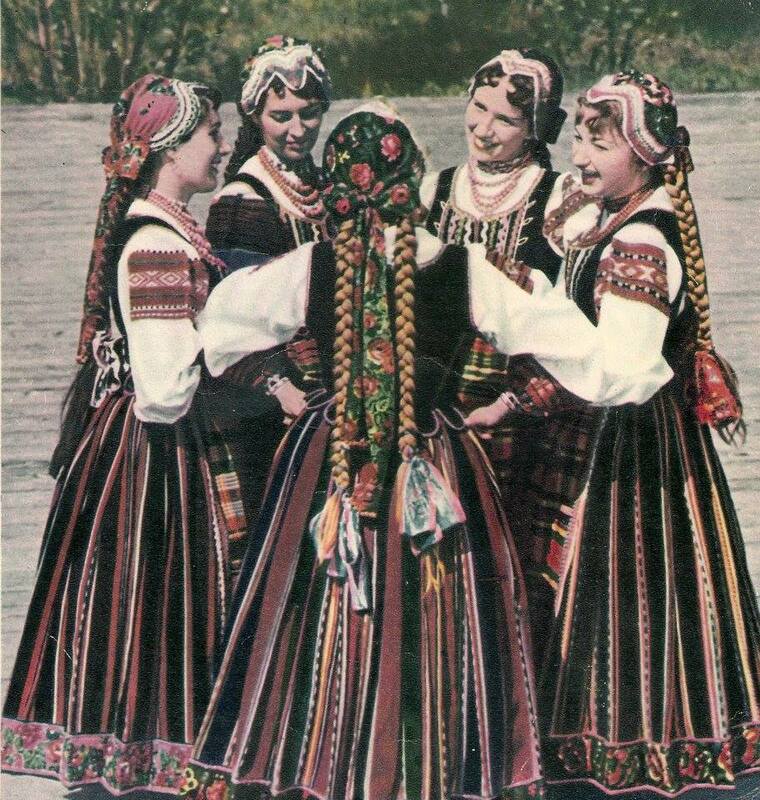 This image is from Polish sources, but certainly looks very Ukrainian. The woman's costume of Podlesie comes in four variants, the Nadbuzhansk, which we are covering, is the most colorful and interesting, besides being the most intermediate in detail of the costumes of these three countries. 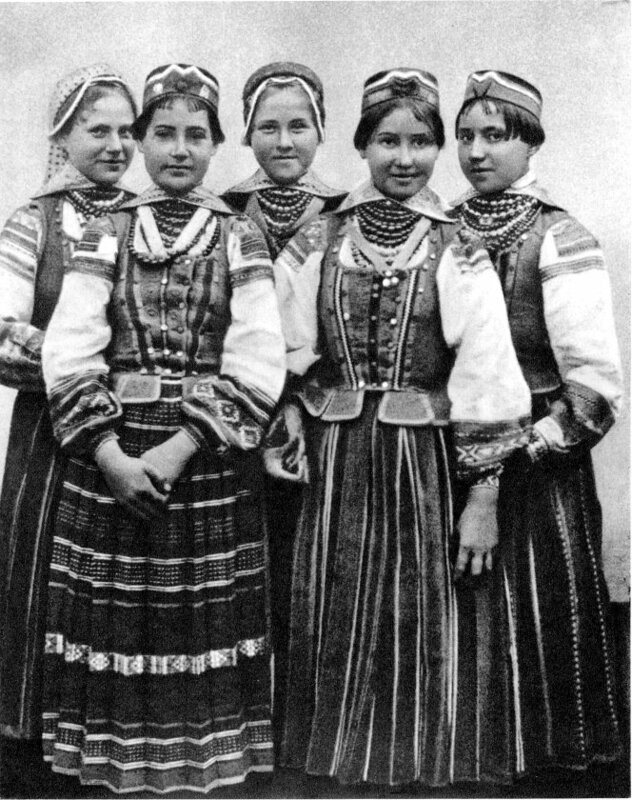 There is also the Wlodawa [Volodova] costume of southern Polesie [Pidlassia], which more closely resembles the costumes of Polissia east of the border in Ukraine and Belarus, the Radzynsk costume of western Polesie [Pidlassia], which resembles the Nadbuzhansk somewat, and the Mazowian costume of the area around Biala Podlaska, which is much more completely Polish in style. 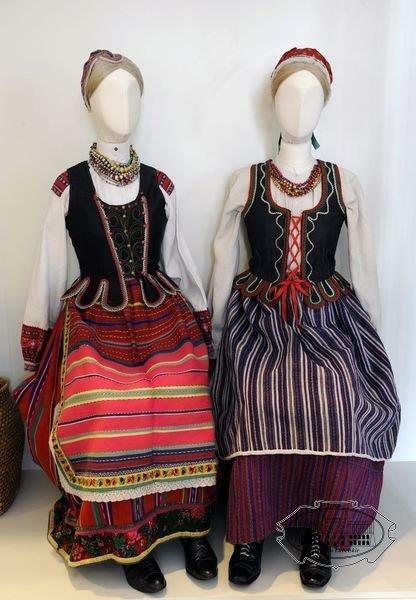 Here is a photo of the Nadbuzhansk costume on the left, and the Wlodawa [Volodova] costume on the right. 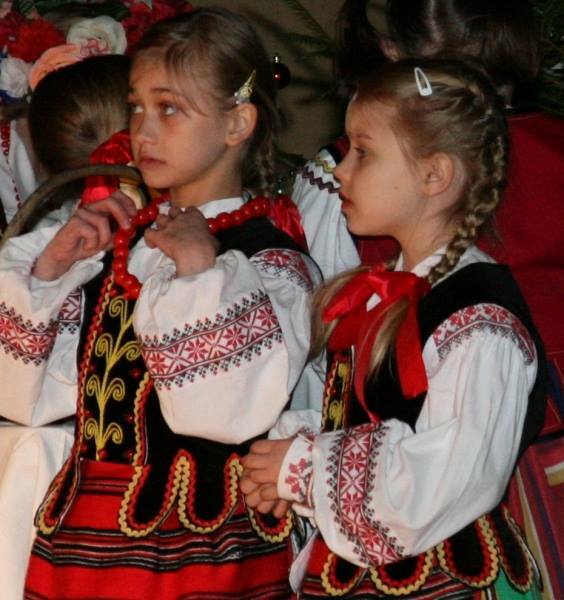 And this is the Radzinsk costume, which is found around the town of Radzyn Podlaski. It differs in details of the skirt, apron, bodice and cap. Here we see the Nadbuzhansk costume on the left, and the Radzinsk costume on the right. 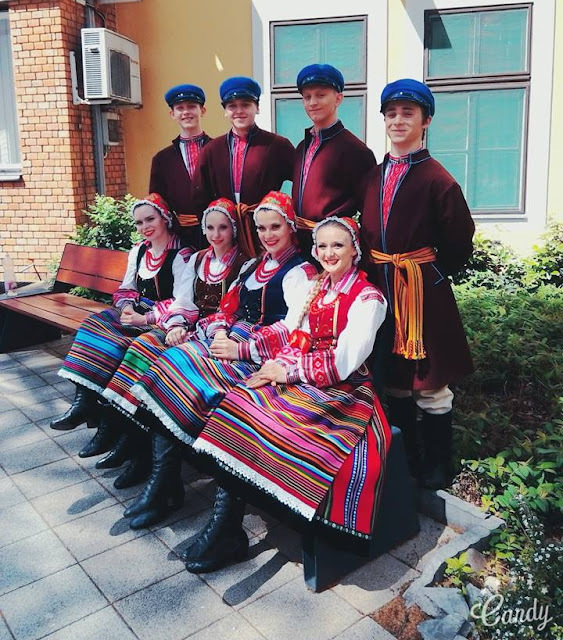 Here is the costume of the district around Biala Podlaska. 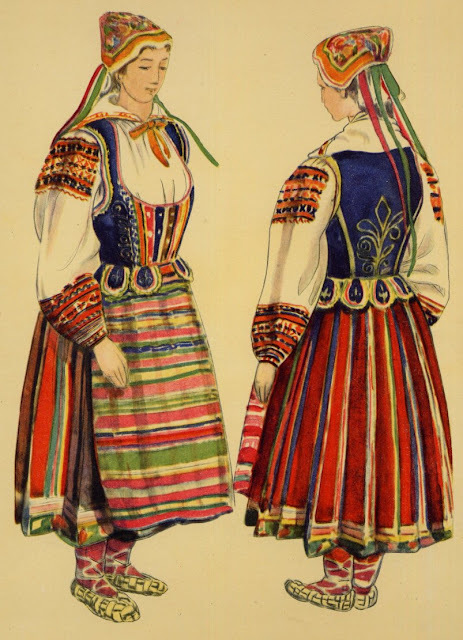 The tulle bonnet, the plainer striped apron and skirt and the lack of ornamentation on the chemise all contribute to this resembling very closely a purely Polish Mazovian costume. 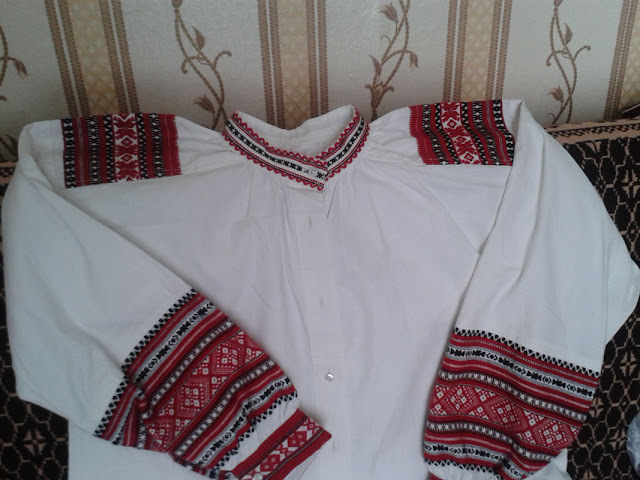 To continue with the Nadbuzhansk-Zabuzhia-Damachow costume; the woman's chemise is made with the ustawka or przyramek cut. as seen here. The shaded areas contain a woven design, typicallly with solid stripes on either edge and a more open design in the center. The collar may be a narrow standing one, or folded over, some photos show a larger, almost 'sailor' collar like the ones found in Krzczonow and Sokal'. 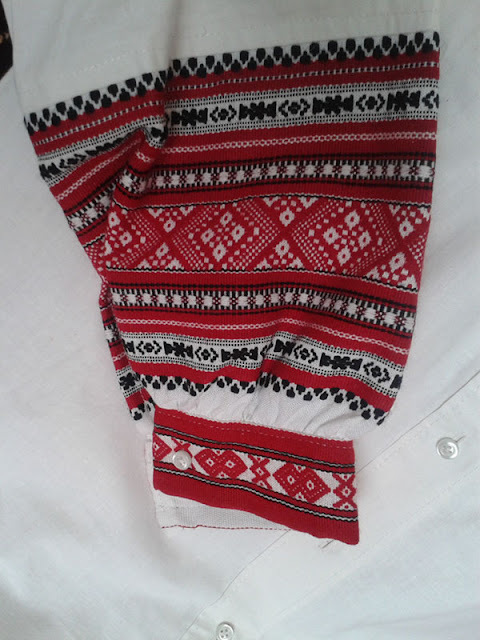 The inclusion of the woven design on the lower sleeve is unusual. 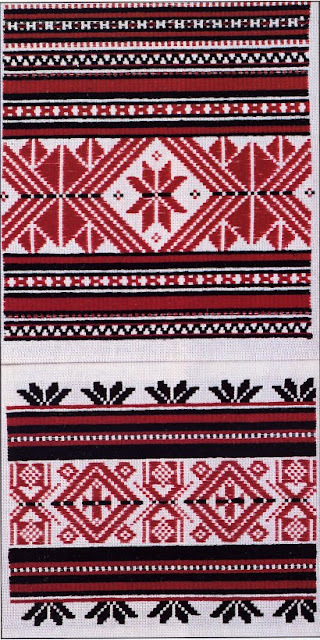 It is also found in some districts of the Volyn' region, but nowhere else in the area, although it is very typical of Lithuanian costume. This may be a way of using up an entire loom width of the woven design. Here are a couple of examples of the woven ormanent. That of the Wlodawa [Volodova] region is similar, but more open, with much more white background showing. 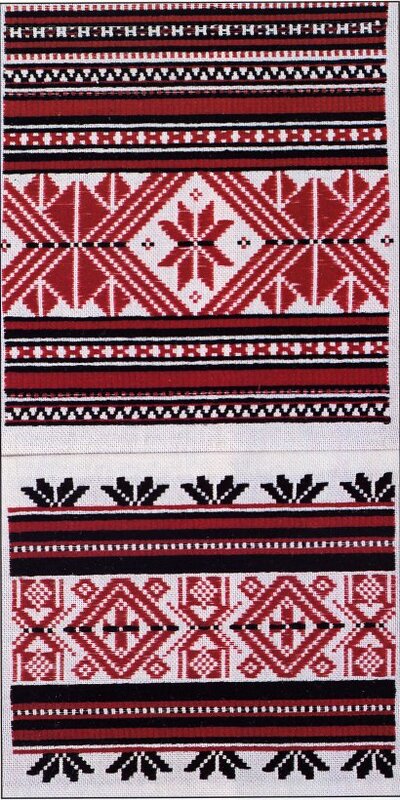 Woven ornament of similar design is also typical of the costumes of west Polissia in both Ukraine and Belarus. 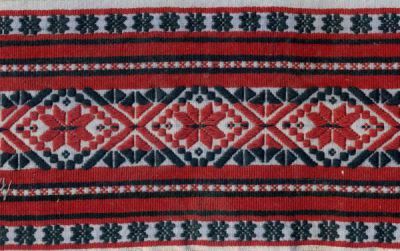 In Polish sources this is referred to as 'haft tkany', or woven embroidery. Here is an image of such a shirt. 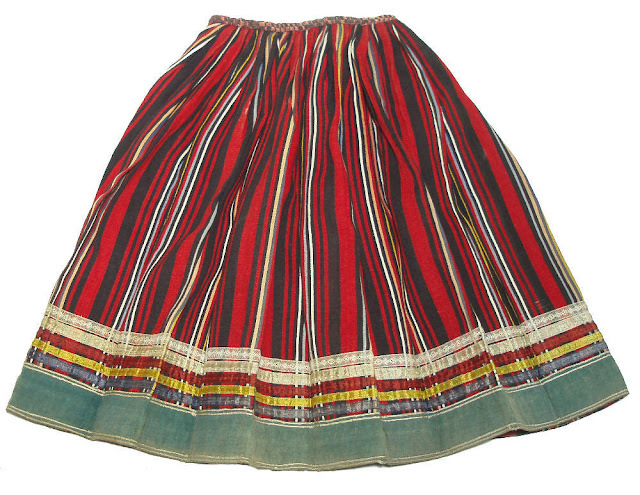 The skirt is made of wool, usually woven in vertical stripes, with wide stripes interspersed with groups of narrow ones, the center stripe in each group having two or more colors alternating. The wide stripes are referred to as 'paths' and the narrow ones as 'posts', after being gathered into the waistband, the skirt was pleated on three sides, leaving the front flat, the narrow stripes showing on the top of the pleats, and the wide stripes inside. The colors of the wide stripes would then show when the woman moves. 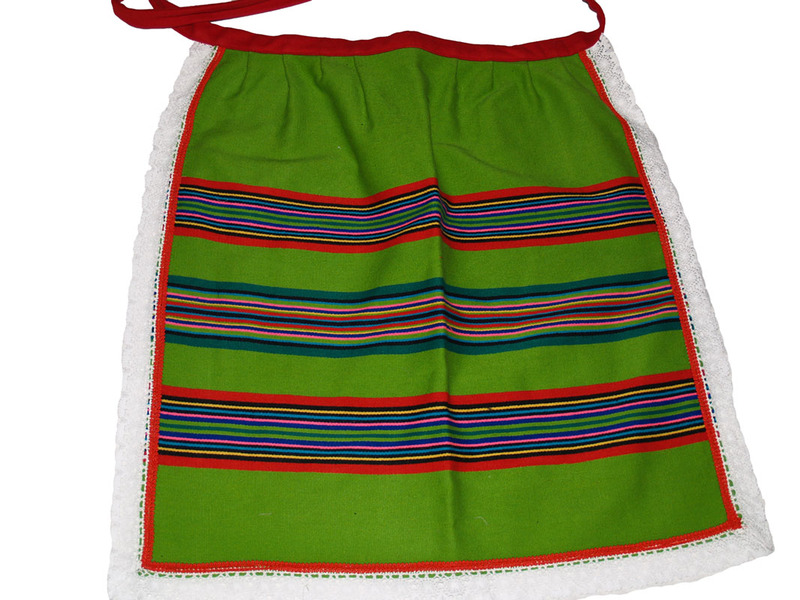 The bottom of the skirt was often edged with a piece of different cloth, effectively forming a horizontal stripe on the bottom. This was edged with ribbons also running horizontally. The apron was made of woolen striped material, see the various images for the various arrangement of the stripes, but they were usually horizontal. Most common seems to be wide stripes of a solid color alternating with groups of narrow stripes. This was edged with factory made ribbon and/or lace. 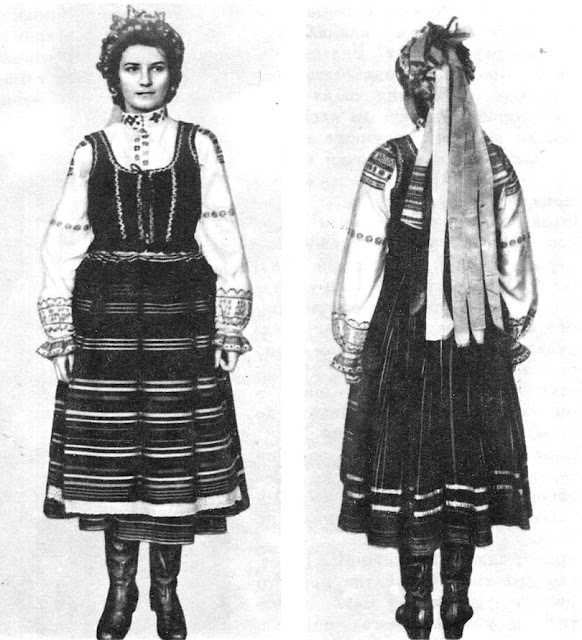 The bodice, korset or gorset, was similar to the Maloposlka or Volyn' type, but was not laced up with a ribbon. It had lappets, either sewn on or cut out of the whole cloth, which was a solid color. There was a seperate placket attached to the front center, fastened by hooks. 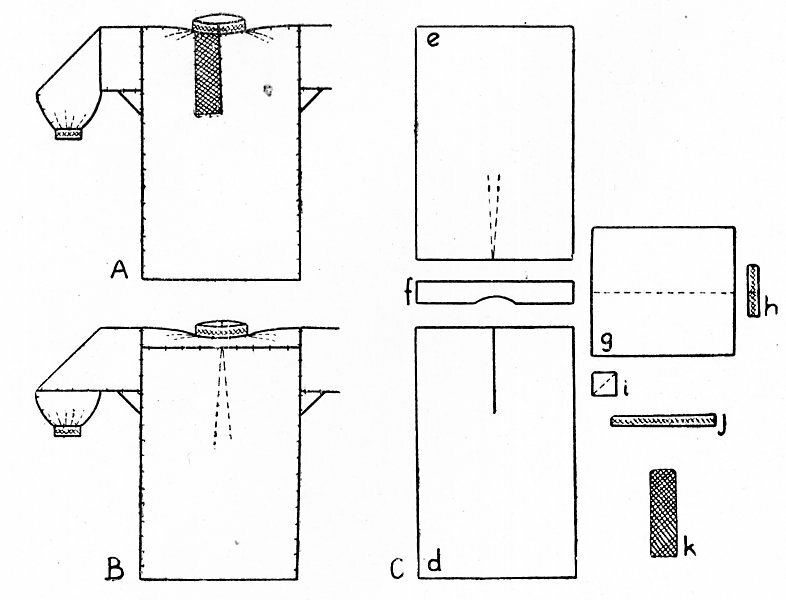 The lappets were edged with rickrack or ribbon. 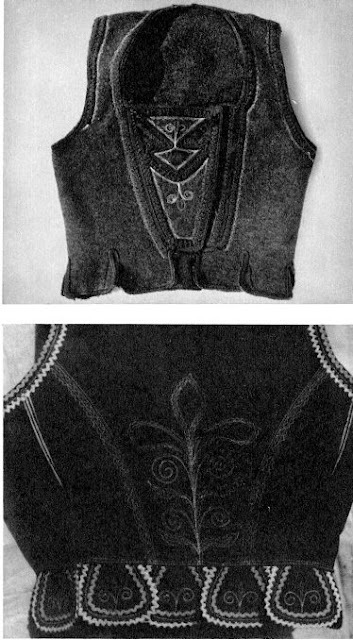 The front placket was edged or decorated with ribbons or galloons vertically. 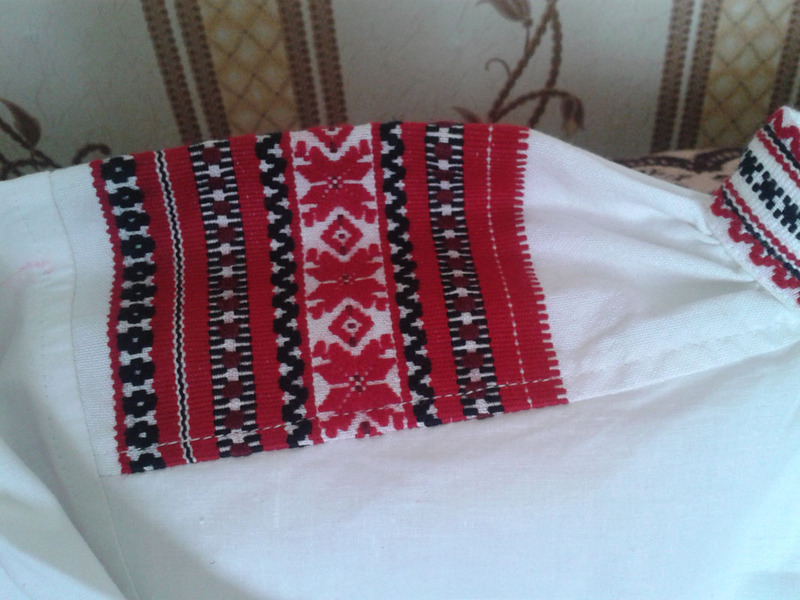 The center of the placket, the lappets and the center back were decorated with topstitched or backstitched designs. It was lined with calico. Here is one cut used. 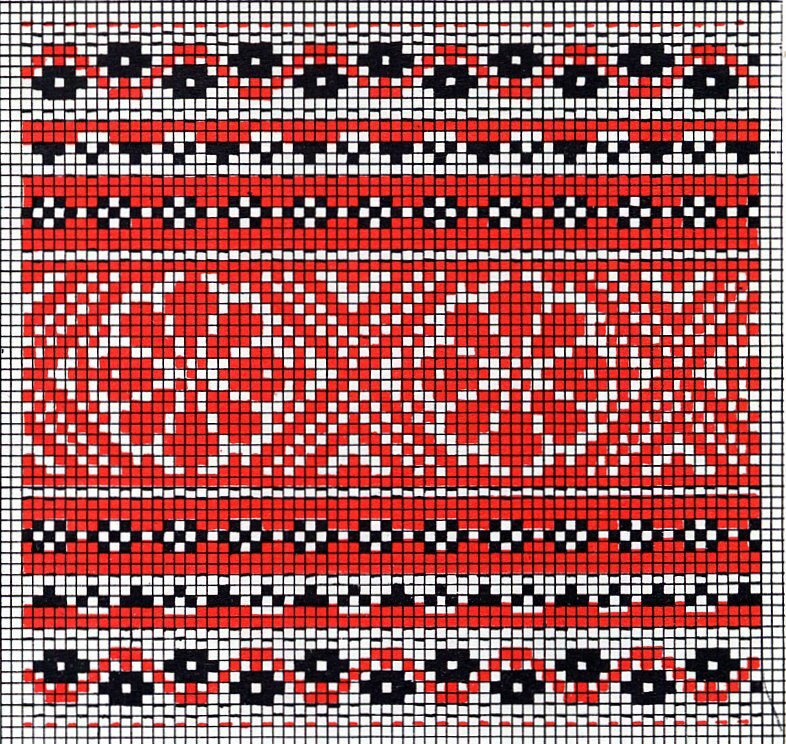 Here is some detail of two different korset/gorsets from the Belorussian side. 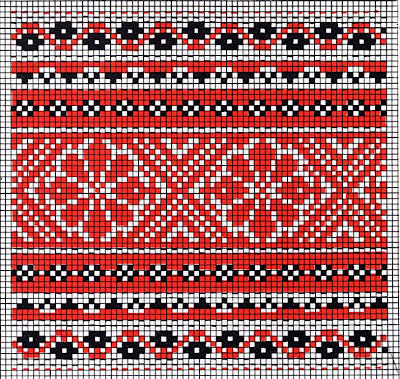 Below is a color detail of the front of one from the Polish side. This is the same one as in the color photo above. Notice that in this case, there is a ribbon in the center of the design. 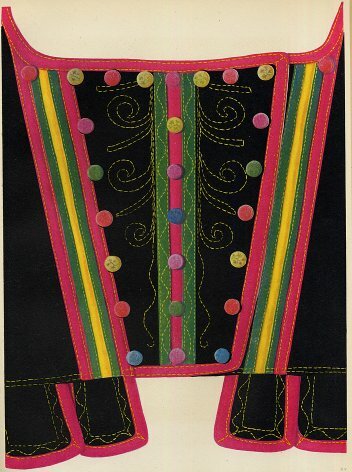 Here is a vest from a contemporary stage costume. If you look at the various images, you will see the silk cap with ribbon edging, which is worn by married women. It has a characteristic point in the front, and often ribbons hanging behind. See this photo, which is again from the 'Folk Costume Fashion Show' in Lviw in 1936. [ i wish they had color film back then!] This is Myrosia Hordynska at that event wearing this costume. 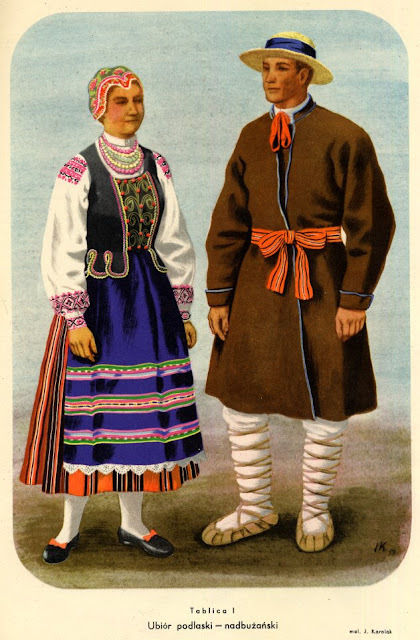 Caps for married women are very common throughout the larger region, but this does not resemble most of the others, rather being reminiscent of those worn in Sweden and Finland. The photos from Damachow in Belarus, however, show some of the caps being more of a pillbox shape, as in this photo, also, from the top photo, they seem to have been worn by quite young girls. Now that i take a second look at it, i suspect that the two in back are married, while the three in front with their hair showing are single girls. Note that the charactarisic notch design is still present on their caps. Here is another photo of a girl from the Ukrainian side, wearing what I believe is a bridal headdress. Thank you all for reading. 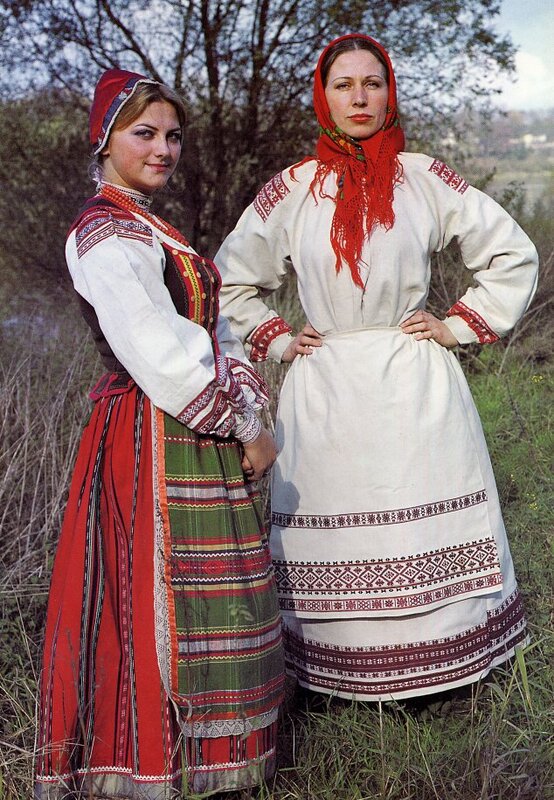 I think this is a beautiful outfit, and shows what can happen at the edges of different traditions. Here you have elements from Mazovia and Polissia coming together to create something of grace and beauty. Again i hope this inspires you to create, to make things that you use in a beautiful manner, instead of being satisfied with what is mass produced. Thank you for sharing your research. Very interesting and quite beautiful to look at. There was no such thing as Polish Empire, there was Polish - Lithuanian Commonwealth, which consisted of the Kingdom of Poland and Grand Duchy of Lithuania and included some of the lands of today's Ukraine and Belarus. Technically, yes. But in fact, in the later period it was completely dominated by Poland.